Chroma. Somehow, it and the Razer brand seem to be slowly infiltrating my life. It all started a few years back when I bought a pair of Razer Tiamat 7.1 gaming headphones. Mostly because I had come back to PC gaming and have been known to be a bit of an audio/home cinema guy in the past and figured I’d give multi-channel on head a try. Unfortunately my initial brush with “The Cult of Razer” wasn’t a great one and I ended up giving the headphones to a friend. Discrete multi-channel on the head wasn’t good and I’ve since settled on single driver headphones for my gaming needs. But since that initial purchase, I’ve come into contact with Razer increasingly in the last few years and aside from that one ignominious pair of headphones, I’ve genuinely liked a lot of their other products, to such an extent that my phone is now a Razer Phone (pending the RED Hydrogen One launch), my wife has a Razer Blade Stealth, I regularly use a Razer Wildcat controller for gaming and now I’m sitting here reviewing the new Razer Nommo Chroma speakers. The Nommo Chroma’s are interesting looking things. Eschewing the typically rectangular upright route that many PC speakers tend to go down. A handsome pair of cylinders without a subwoofer. Wait what? Yes, you heard that right, here is the first oddity, a pair of £170 PC speakers with no sub? 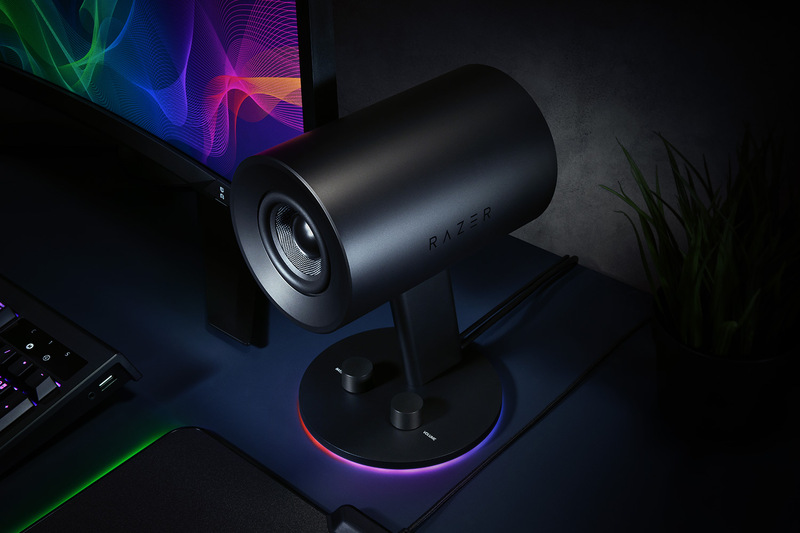 To be fair to Razer, they do a good job with the built in rear-facing bass ports and given the clutter that is both above and under my desk, not having a sub is nice, I just hope it won’t significantly compromise the sound. Still, my day to day speakers on the PC until now have been the solid Creative Gigaworks T40 Series II speakers and they don’t have a subwoofer either, but at this price point I’m slightly surprised. The drivers themselves are uncovered, I personally prefer a bit of fabric to keep pesky child fingers away from the delicate areas that they always seemed to want to poke when they were younger but my kids are old enough now to know to keep away from my PC so it’s not particularly an issue these days. An understated Razer in shiny black on the side of the speakers and two knobs on the base (bass and volume) finish up the exterior look. 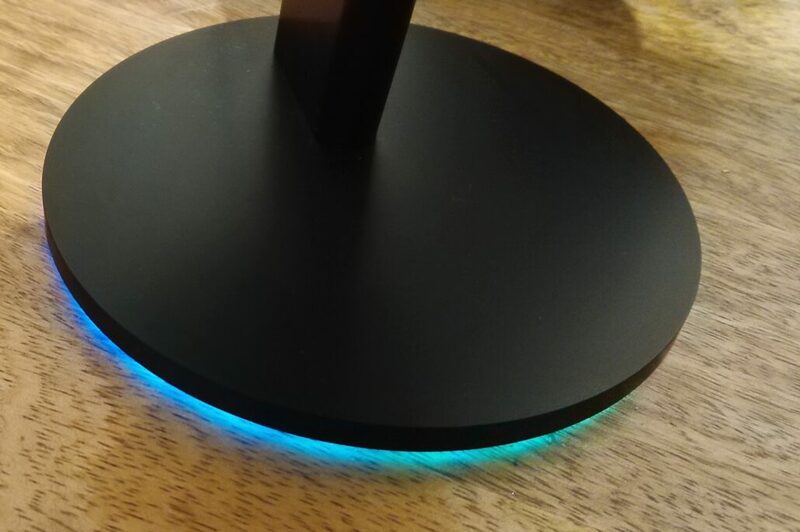 Connectivity of the Razer Nommo Chroma is via USB or 3.5mm jack, of course if you want to use Chroma lighting (which, let’s face it is the entire reason you’d look at these rather than the cheaper Nommo non-Chroma edition), you’ll be using USB. Touted as “Full range” gaming speakers for PC with a Custom woven glass fibre 3 inch driver and rear facing bass ports, let’s delve into the details a bit. There are 2 x 3 inch “full range” drivers, one in each speaker. Frequency response is rated at 50 Hz to 20 kHz meaning they don’t quite get a pretty good range and certainly the average person is unlikely to notice the missing top and bottom end in everyday use. 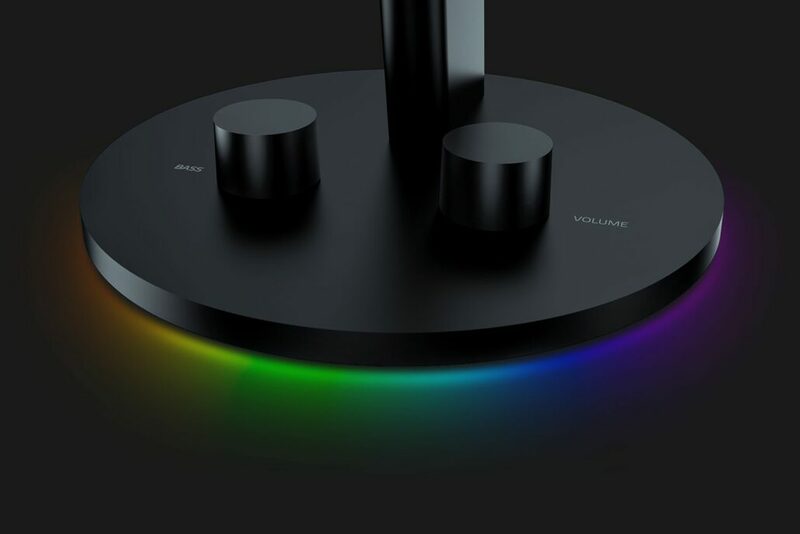 Razer Chroma lighting with the usual Synapse integration and 16.8 million colours at the base of the speaker stands. As is often unfortunately the case when it comes to PC audio, Total Harmonic Distortion (THD) isn’t quoted, so you’ll be relying on my aging ears to talk about distortion. A lot of audio kit will tend to focus on or around what I refer to as the “standard” 20-20 range. This is talking about the frequency response from the low end to the high with 20 Hz to 20 kHz. “High definition audio” will tend to try to extend that range somewhat, going from single digit Hz up to 40 kHz or even more (100 kHz for the ridiculously expensive Sennheiser Orpheus which will set you back over $50k). Realistically, as people age, their ability to genuinely hear the more extreme ranges disappears, low ends probably start at about 50 – 60 Hz for most people and will top out somewhere approaching 20 kHz. Below this it is more about “feeling” rather than hearing the bass and above the top end you may get a bit more range in ideal conditions with no other background noise etc but this, coupled with the fact that many people will be listening to lossy audio formats on a range of variable quality phones, sound cards, speakers etc mean that if you want a serious high definition audio experience, you’re unlikely to just look at buying a set of speakers for a PC, it’ll also cost you a lot more. Where you can listen to what gets lost in the compression process of Tom’s Diner (one of the control songs for the development of the original mp3 standard). You’ll obviously realise from this that you lose quite a bit. Since the IPO last year, Razer has been growing up a bit, to the extent that they now send out reviewer guides with their kit for review and a suggested list of games and music to test out the audio capabilities of the speakers. These are of course recommendations only and although there are a fair few songs I like in the list, I (virtually) rip up the review guide and throw it away. I have a list of tracks I use for audio reviews and like the range of audio types they give me. While it does tend to span the full range and therefore most equipment will get tripped up somewhere, I like to give people a broader understanding of the kit they’re buying than just what the manufacturer decided to tune the kit to. As such, I’ll be using none of the recommended track listing and sticking with my usual samples. I always tend to kick things off with what is usually a tricky piece for gamer centric audio. Mainly because it’s probably the exact opposite of what the kit has been tuned to. Tchaikovsky’s Symphony #6, Allegro Molto Vivace. In particular the opening few minutes of third movement as recreated by Herbert Von Karajan conducting the Berlin Philharmonic in 1964. At this point, I’m sure that most people reading this review will likely skip ahead to the next audio track, but it’s worth reading on. This is a very quick, delicate and precise instrumental section and over the years I’ve found it useful for its ability to show the general muddiness and lack of precision in audio kit, even pretty high end equipment. Unsurprisingly here, they aren’t brilliant, but at the same time they’re not bad. The one size fits all drivers tend to get slightly let down here with the lack of tweeters to pick up the high frequency end of the range. I try to help by turning the bass down a bit and that allows some of the brighter sounds to come through a bit clearer, but if you’re looking for PC speakers with great high end capability, these are probably not going to cut it for you. That much said, in this price bracket, there isn’t really anything that will be better so it’s a positive start for the Razer Nommo Chroma. The rest of the piece aside from the opening part is well reproduced. Next up should be more in line with the Razer’s gaming ethos. Eddie Van Halen’s ode to the electric guitar that is Eruption. This less than 2 minutes piece has so much raw musical energy and the Nommo Chroma’s handle it with the aplomb I expect of them. Drums are nicely defined from the rear bass ports and here the high end doesn’t have the lack of precision of the classical piece. The final musical piece I use is Pink Floyd’s Echoes from their Meddle album. It’s an amazing, 23 and a half minute long “song” which takes the listener through such a range of musical styles. It also gives me a great opportunity to shut the family out for half an hour or so because I need to “work” and listen to it very carefully for the review! The haunting opening pings come through with the usual dose of the shivers that accompanies them as I settle in to listen. Range feels good here with the Razer Nommo Chroma creating a nice and expansive soundstage although I do start to notice a little bit that they’re pointing too low for my taste and here we run into my first slight problem with them, namely that they’re angled horizontally to the desk where of course my head and consequently my ears are a couple of feet above the desk. It’s not a deal breaker, but it would have been nice if the speakers had some kind of a bracket which let the angle to the desk be adjusted somewhat. Other than my fussiness over angling the speakers a bit, the audio is great throughout the entire song. Everything from the throbbing bass, clear lyrics, wailing guitar to Pink Floyd’s use of experimental sound effects, the lull mid way through with the odd wailing effects. I’d half expected the Razer to struggle a bit here but one thing I do notice is that these are very capable and probably the best endorsement I can give them is that I struggled to stay analytical during my trek through the song and just finding myself lost in it. That’s a good sign. Let’s face it. This is Razer I’m talking about so this is where the Nommo’s should shine. Here I do pay attention to the suggested game list and there’s a corker included here that I love, that being the 2016 Doom reboot. I’ll throw a couple of others into the mix too, those being Alien Isolation which (despite its age) does an excellent job of using audio to drive the overall experience and finally of course some Star Citizen will round the test out. It’s interesting to note in the reviewer’s guide that Razer is comparing features with the Bose Companion 2 PC speakers. It kind of makes sense, Bose is obviously a name that a lot of people recognise in sound, even if a lot of audio snubs look down on the brand. The Companion 2 isn’t a direct price competitor with the Razer Nommo Chroma but if you drop down to the non-Chroma version, things make more sense. I’ve had a reasonable amount of experience with the Bose Companion series but don’t have any on hand to do a direct comparison. The interesting aspect is that Razer is touting the fact that Bose uses channel mixing as being worse for gaming and I’m personally somewhat inclined to agree. Gotta get some of that Chroma… or not as per your preference! Channel mixing is kind of an odd concept to me and I’ve never particularly gotten on with it unless it’s trying to recreate 5.1 or greater surround sound. I wouldn’t so much have called myself an audiophile snob but I’ve certainly spent a lot of money on audio equipment in my life, mostly on multi-channel audio for home cinema whereas audiophiles tend to go for purity of musical reproduction and 2 channel audio. The basic premise is that software algorithms can make the audio experience “better” than a straightforward 2 channel experience and something akin to a dedicated multi-channel setup, other aspects of channel mixing try to make for a more natural sound from the dual channels but this is somewhat nonsensical in speakers (if not so much in headphones) given that we naturally hear dual channel speakers in the way that we’re “supposed” to with sound from the left channel also being audible in the right ear, just slightly quieter and slightly after it hits the left. The cinematic or home theatre audio setups you get have generally clearly shown that if you want multi-channel sound, get multiple channels. Mixing algos have varying degrees of success, but even in much more expensive ones than the Bose, will generally have problems. So, with that brief background aside, let’s get to the games. Doom is an amazingly atmospheric game, one which uses sound to great effect. Chilling build up and pounding action sequences are equally done justice by the Razer Nommo Chroma and the thumping bass line is significantly chunkier than my Gigaworks T40’s. Samuel Hayden’s equal parts grizzled and robotic voice sounds amazing and I’m finding myself falling in love with this game all over again, untouched since my initial completion run after it first came out. Alien Isolation of course tends to focus on the tension building audio to really bring the horror aspects of the genre alive and I’m pleased to say that this comes across really well in the audio from the Razer Nommo Chroma, again a significant achievement at creating an expansive soundstage whilst still capturing well the confined spaces in the game. Finally, to Star Citizen. I’ve got access to 3.1 in the PTU but will stick with the current live server version 3.01 of the game for the sake of stability. Audio in FPS on the ground and in EVA modes is excellent, positional gunfire from others sounds nice and accurate (as accurate as you can get out of two channels of course, for more positional accuracy you’ll need to go to 5.1 or more speakers) and in ship, the soundtrack pops and dogfighting in space is again something to get lost inside. Missiles and ship guns carry suitable amounts of pop and even the game’s more delicate audio tracks are nicely accurate in their reproduction. So the Razer Nommo Chroma are definitely good speakers. The nice little flourishes like the Chroma lighting being used to indicate the volume and bass level when you adjust them are useful, they sound great and the bass thumps as a set of gaming speakers should, particularly well considering there is no dedicated subwoofer with these. Are they great? That’s a tougher question. Realistically, it’s going to come down to the individual user. If you’re deeply embedded in the Razer Chroma ecosystem and need your RGB lighting, these are a great pair of speakers. That much said, if you’re not then you will probably want to save yourself some money and go for the standard Razer Nommo at $100 instead of $150. Fifty bucks strikes me as a fair bit to pay for Chroma and a USB connection, but there are obviously some people (my wife among them) who love their colours. As such, for me personally they lose a value point here but if you’re into Synapse and Chroma, you could probably add one or two points. The press shots look much nicer than mine, that black attracts fingerprints and dust! Audio is very good and Razer has done an excellent job of finding the sweet spot in terms of price/performance. PC speakers are something of a hit or miss affair with most in the sub $200 bracket (which let’s face it, is the majority of the market) coming in as a miss. There are a few different categories of PC audio in my opinion. At the bottom end, there are a variety of no-name companies with cheap nasty stuff you generally want to avoid. Moving up the price range you’ve got companies like Logitech and Creative who make decent, solid speakers which aren’t too expensive. Then come the big audio brands trading off their name such as Bose and Harman Kardon who are trying to compete at what to them is the low end of the price spectrum who don’t really cut the mustard sonically (I was quite disappointed when I had the HK SoundSticks, both with audio and build quality). Above these, you get some lesser known brands who have obviously spent quite a bit of money on their speakers and some of the more known higher end audio brands who have entered the market at relatively high price points which the market probably doesn’t bear such as the $500 Bowers & Wilkins MM-1’s which are now no more with no replacement currently available. The way I see it, there’s something of a gap in the market for a company with a decent audio pedigree to make an honestly good, upper-mid range set of PC speakers. In times past, that probably wouldn’t have been Razer, but these days with it owning THX and seemingly wanting to be serious about audio, it feels like it could be. I’m pretty surprised they didn’t quote a THD number because putting them up to maximum revealed decently loud speakers without significant distortion. As general purpose PC speakers then, the Razer Nommo Chroma are great PC speakers. They don’t quite do enough to get an award due to the mixed performance with high end, but for a 2.0 solution without a subwoofer, they’re excellent for anyone cramped on space for a sub and let’s face it, delicate classical music is unlikely to be what they’re called upon to reproduce on a daily basis. 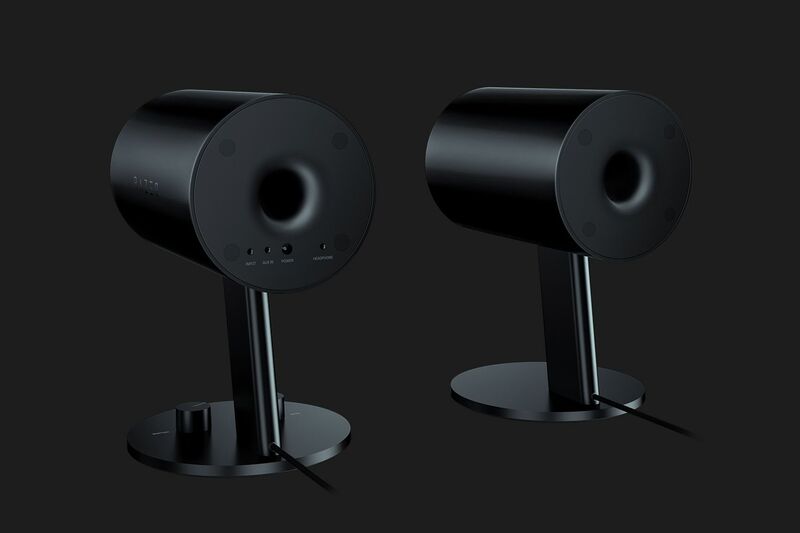 Of course Razer has something lined up for us in that respect with the incoming Razer Nommo Pro which is THX certified, uses Dolby virtual surround, have dedicated tweeters for the high end and a sub for the bass you feel rather than hear. Razer has done an excellent job of finding the sweet spot in terms of price/performance ratio for PC speakers.